Blogging remains a smart, affordable and manageable SEO strengthening strategy for small businesses. Smart, because a continuous flow of keyword focused content shows Google that your site is active and growing. Affordable, because written content is currently the most affordable content to purchase or create. Manageable, because this content should show off your small businesses expertise. In theory, you’re explaining the value you provide every day which is something you know a lot about. Every site has keyword strengths and weaknesses and it’s through keyword research that you’re able to discern yours. Keyword research (using the AdWords Keyword Planner or other SEO tools) allows you to gain visibility into exactly which search terms and phrases are being used by your potential customers. Often, this is a mix of more general keywords with high volumes and more exact keywords with smaller volumes. The trick is to create a site which balances both the competitive high-volume terms and the less competitive low-volume terms. After conducting keyword research, take an audit of your site’s content and rankings to discern where your site could use an extra boost. Create a prioritized editorial calendar based on the most important keywords you should focus on, that are also the weakest in your current rankings. For example, let’s say you’re both a residential and commercial electrician but your site is mostly ranking for search terms relating to residential electrician services. Your upcoming blog content should focus mostly on your commercial services to balance out your rankings. Highly shareable content is also extremely valuable to SEO. It helps to create backlinks, increase the number of referring domains and boost brand awareness. The key to shareable content is creating content that provides free value to prospective customers. This content helps to reinforce awareness of your expertise and more importantly, it makes your audience feel connected to you without having to pay you for something. Offer a guide full of tips on how to do something better or how to avoid mistakes. For example, if you’re a plumber, one idea is to write a handful of blog posts on basic DIY tips or some little-known easy plumbing tricks. A blog post that clearly shows how to install a shower head or unclog a sink is very likely to get shared. This leads to both stronger SEO and more leads for large plumbing projects as readers will become familiar with your company and think highly of you for offering valuable content. When brainstorming SEO blog content ideas, ask yourself what are the most common questions that potential customers ask. Then, write blog posts that answer those questions and be sure the title of the blog post is the question itself. The strategy here is two-fold: 1) with the increase in popularity of voice-activated assistants like Siri, more and more search queries are spoken questions and 2) this is another example of providing free value in the sales process. Simple as that, rinse and repeat. If you need a surgeon, you want the one who has done the exact procedure you need a thousand times before. You want the one who has seen it all, done it all and has the lateral/creative thinking to do well even if the surgery turns ugly. This is the thinking behind creating case studies for SEO blog content. Case study posts are keyword rich, as they obviously involve the products/services you aim to rank for, but more importantly they’re also a powerful sales tool. Strong and clearly-written case studies demonstrate your knowledge, skills, and execution in doing the work someone is considering you for. They prove results and build confidence that you’ll solve problems for your future customers. This is similar to case study posts but usually more story-based rather than analytical. If you have a very satisfied customer/client, ask them to write something up about their experience or about their journey with you. (Often, sweetening the pot by offering a future discount is enough to ensure they follow through). Again, this blog content will be very keyword rich, a source of free value, a potent sales tool and overall great SEO blog content. We recommend that every small-to-medium sized business maintain a regular and informative blog. Posting at least once per month will not only show Google you’re an active website but will offer valuable content that will increase your SEO and help in your sales process. 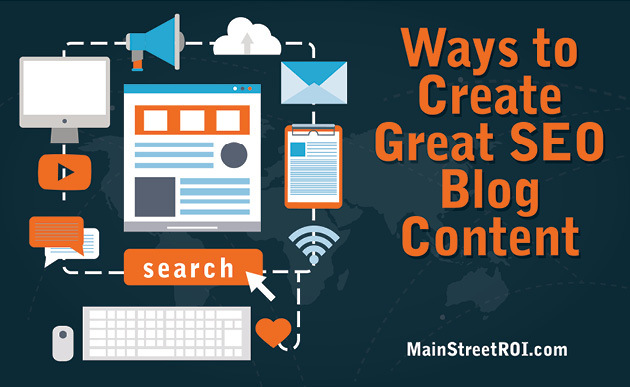 These five content creation strategies are a great way to stock your blog with high-value, shareable, and SEO-strengthening content. Write strategically and write often!